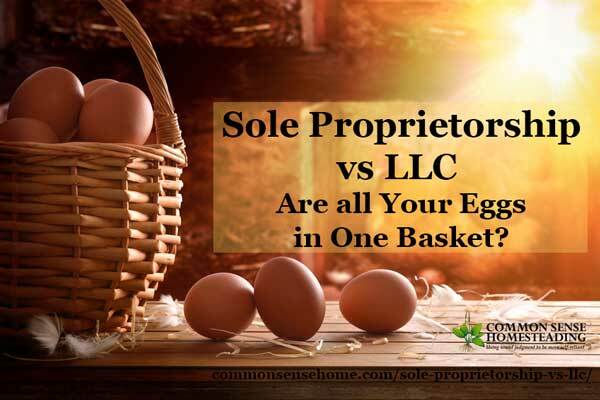 Sole Proprietorship vs LLC - Are all Your Eggs in One Basket? 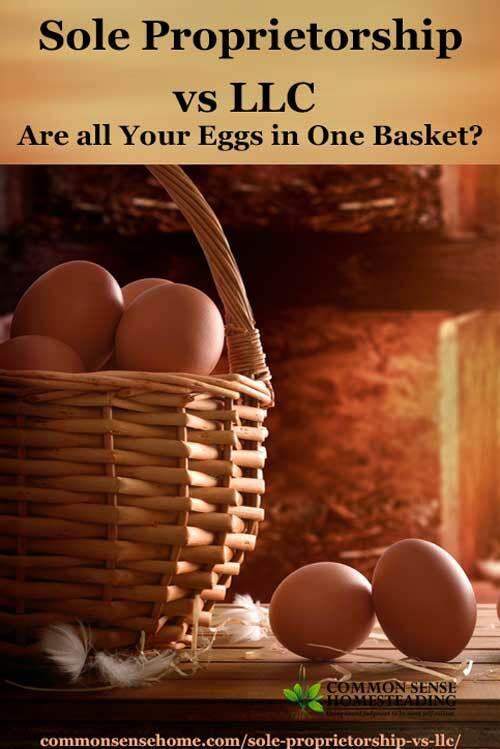 You are here: Home / Homesteading / Sole Proprietorship vs LLC – Are all Your Eggs in One Basket? Sole Proprietorship vs LLC – Are all Your Eggs in One Basket? Sole Proprietorship vs LLC – If you sell anything to anyone, you are running a business. To protect your farm or small business, as well as your private assets, you should consider whether a sole proprietorship or an LLC is your best option. The vast majority of farms are sole proprietorships because this is the default organization if you do not do anything. To busy farmers, it can seem easier and less time consuming to just let the farm be a sole proprietorship than to do something formal to organize it. One problem – if your farm is a sole proprietorship, there is no distinction between you and your farm. All your eggs are in one basket. If your farm is a sole proprietorship, the income, assets, and liabilities of the farm are synonymous with your income, assets, and liabilities. Many sole proprietors adopt a “DBA,” which stands for “doing business as.” Maybe you describe your farm as “Jane Smith, DBA Clean Acres Farm.” This recognizes that your farm is a business, but it doesn’t change the fact that you and your farm are essentially interchangeable. That the income is the same may not be particularly problematic (if you’re unsure, ask your tax advisor), but assets and liabilities can be a very different matter. Here's why: If someone has a legal claim against the farm, and there’s no distinction between the farm’s assets and your personal assets. All of your assets may be on the line every time the farm incurs a liability. You could lose everything. Let’s look at some examples. If you are a sole proprietor and take out a loan to purchase farm equipment but fail to repay that loan, the bank could get a judgment against you for the debt and file a lien against all of your property to satisfy that judgment. Similarly, if someone is injured on the farm, a judgment could effect all of your property (not just property owned by the farm). By contrast, if your farm is a corporation or LLC, your assets and liabilities are separate from those of the farm, which could provide you with significant protection in these situations. Note: A corporation is another option for organizing your business, but it's more complicated and generally not the best option for a small business. Read more about incorporating your business. The LLC offers the best of both worlds – a lot of the liability protection of the corporation with just slightly more complication than a sole proprietorship. It allows for joint ownership of the enterprise without the personal exposure for the liabilities of the enterprise that may come with a partnership (where each general partner is jointly and severally liable for the liabilities of the business). 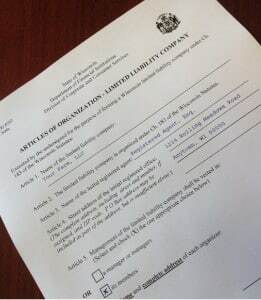 In many states, you form an LLC by filing “articles of organization” with the state. Necessary forms are generally available online. You may be comfortable completing and filing the forms yourself. If you have any questions about completing or filing them, be sure to consult an attorney licensed in your jurisdiction. Read more about Articles of Organization and view sample forms. There are many considerations in deciding on a name. Is the name available in the state in which you wish to organize? Is a related URL available for a web site? (You may not want an online presence right now, but you might later.) Search domain names. Does someone else have trademark rights to the name? Search trademarks. Many states require “LLC” to be in the name of the entity if it is organized as an LLC. Read additional rules for LLC names. What is a Registered Agent and where do I find one? Another option for registered agent is an attorney. This has two benefits. They are bound by ethical rules to ensure that proper notification is given when they receive process on behalf of a client. If you choose to have the attorney represent you in the action, she will have ample notice of it to prepare a response. Designating an attorney as your registered agent does not mean that they will represent you in court. That is up to you. The designated registered agent can also be changed later, if need be. Member managed or manager managed? The articles of organization form also has questions about management – i.e., is it “member managed” or “manager managed”? This is asking who has authority to act on behalf of and bind the farm to agreements such as loans, mortgages, and sales agreements. Read more about Member-Managed LLCs Versus Manager-Managed LLCs. Drafting effective and enforceable agreements is more complicated than most people recognize. Even if you prepare the Articles of Organization, it may be worth a few bucks to have an attorney draft the Operating Agreement. Sole Proprietorship vs LLC – What's the Best Choice for Your Small Business? You need to weigh the risks against the challenges of organizing and determine what works best for you. If your exposure is low and risk tolerance is high, then a sole proprietorship is just right for you. If mixing your personal risk with your business risk keeps you up at night, and LLC may be better. Talk with an attorney familiar with your business and with the process of organizing businesses in your area. My law practice is an LLC and am a big fan of this organizational structure for the right businesses. Disclaimer: This post is for general information only. As always, consult a lawyer familiar with the laws in your state and/or your tax adviser about your particular circumstances. Note on terminology/applicable law: Corporate law is governed primarily by state law. Your state may have different terminology and laws governing formation of LLCs, but the concepts are likely very similar. This is a guest post by Amy Salberg, The Real Food Lawyer. Amy is an experienced business lawyer from West Bend, Wisconsin, with a law practice that stretches across the nation. She specializes in regulatory compliance – that is, helping businesses navigate regulations governing their relationships with vendors, consumers, and the public. Originally written in 2012, updated in 2017. What a great post! I never thought too much about the liabilities of attaching a small business to one’s personal affairs. We don’t farm, but know plenty of folks who do and very few have their *assets* protected this way. It’s an unfortunate fact that we live in a litigation crazy world. All it takes is one small mistake or accident to destroy everything you’ve worked for. I hope this post give folks the inspiration to take the steps they need to protect themselves. Thanks for the post. My husband has been getting on me lately about converting to a coorporation or LLC to protect our assests. I just have a small farmer’s market food biz, but people are crazy ! I got liability insurance for my business asap after I had a customer ignore my food label and keep his chili in the cabinet for 4 months – instead of the fridge “up to 5 days.” Thank God he didn’t eat it. Better safe than sorry! Thanks for this great article! Clear and succinct, straight-talking info. I was in the same boat couple of years back. I went my first few years in business as a sole proprietor. Then switched to an LLC once I was sure I was going to stick with it.